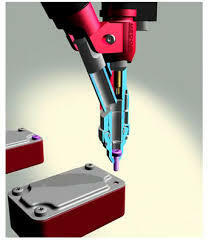 The Mini Me Robot is a bench top articulated arm for assembly and pick and place applications. This robot can work on a folding table. Easy installation and change over for multiple product lines. It's flexible and portabile. Intelligent Automation with Vision On Target 3D Camera is integrated with the Mini Me for real time robot guidance. Easy to setup. Just plug n play. No special video cards needed. The Smart Fixtures provide specialized assembly functions such as micro precision placement, fastening, threading, crimping and cutting. Wide range of grippers/manipulators are available from standard two finger types to pneumatic. Have a specific operation you need to perform repeatedly? The work cell combines the Mini me with On Target 3D Camera and Smart fixtures to perform specific operations. Call us today to discuss your application. Easy and Quick to setup and get running using the Teach Tool. Just point and click with drop down boxes for functionality like "Open Gripper", "Close Gripper". No coding!